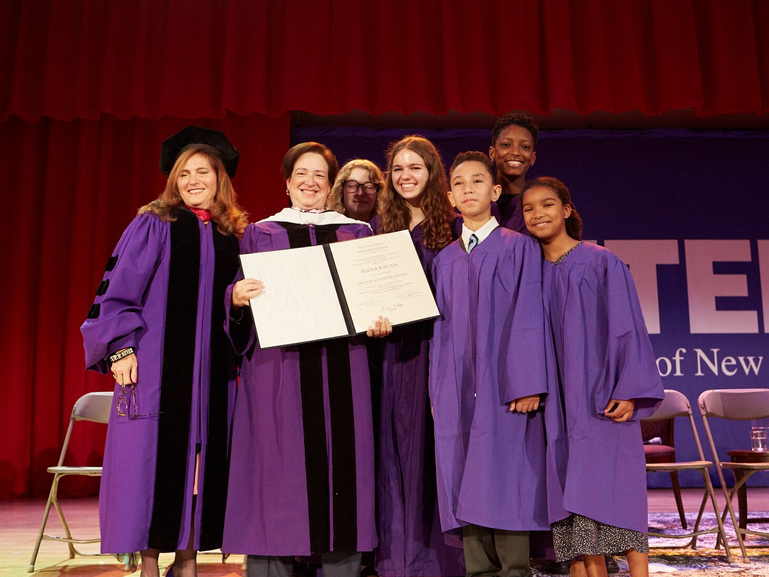 Hunter College presented Supreme Court Justice Elena Kagan with an honorary Doctorate of Humane Letters on Friday, September 21, 2018. The degree was conferred by President Jennifer J. Raab, who opened the ceremony by paying tribute to Justice Kagan’s extraordinary life and career. Afterward, Justice Kagan engaged in a conversation with her longtime friend and colleague John F. Manning, Dean of Harvard Law School. The event was capped by a question-and-answer segment, allowing current Hunter elementary, high school, and college students to present the Justice with questions about her observations and experiences serving on the highest bench in the land. A video of the event can be seen here. For Justice Kagan, the doctorate represented more than an ordinary recognition. As a lifelong member of the Hunter College family, with deep ties to the school that extend to her mother and brother, she said that in her family, this honor is “better than winning the Nobel Prize. ”Justice Kagan is a graduate of both Hunter College Elementary School and Hunter College High School; she last stood at the Assembly Hall podium as a speaker at her high school graduation in 1978. Her brother Irving, also a product of the Hunter College Campus Schools, now teaches Constitutional Law at Hunter College High School. Justice Kagan’s mother, Gloria, was a beloved member of the Hunter College Elementary School faculty who earned her education degree at Hunter College. In 2001, Kagan became the first female Dean of Harvard Law School. In 2009, she again made history when she became the first female Solicitor General of the United States. In May of 2010, President Barack Obama nominated her to the Supreme Court. Asked by Dean Manning to share the most surprising aspect of her life on the Supreme Court, Kagan shared anecdotes of the gentle hazing she experienced as a junior Justice, having to open the door to the Chambers any time an outsider came in – even when that involved hobbling on an injured leg – and having to listen to complaints about lunchroom minutiae as the mandated representative to the cafeteria committee. But her passion for her job was evident, as was her profound respect for the institution she serves and for the eight Justices with whom she shares the bench.